Phenomenological Visions: The First Warbler! Monday April 14th I took a quick lunchtime hike around the bog. On the hike I spotted two firsts of the year. 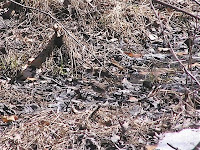 There was a Hermit thrush and a Northern Waterthrush. 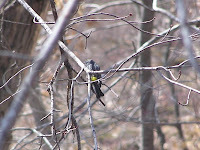 Sorry, no photo of the hermit thrush, I forgot I had a camera in my pocket! I did snap a photo of the waterthrush and this is a sad sign of things to come. I don't have a good telephoto lens so pictures end up looking like this. This is cropped too! I know you're looking at it thinking, where's the bird? Click to see the larger version. The bird is right in the middle. Great camouflage. Technically the waterthrush is in the warbler family so that's the first warbler spotting of the year! On Tuesday, a strong wind blew all day and I knew some birds would be riding in into the nature center. While walking through the downstairs I spotted a bird in the trees through the windows. I was a good distance from the windows but something told me to take a closer look. Bingo. Hello my prettie. Myrtle is back! The Yellow Rumped (Myrtle) Warbler. I grabbed a camera and luckily he kept coming back to the same tree. The autofocus was driving me crazy though and I have a LOT of photos of a blurry bird with really crisply focused branches. An Eastern Phoebe also landed on a branch about six feet away but of course the autofocus completely messed up the photo. Bah!